Today’s blog entry represents my 146th of this year, and 365th overall. Because it’s my 365th post—the number of days in a year, except when leap year makes it 366—I thought it appropriate to blog, briefly, about songs featuring the word “year” (not as a calendar year, but as a long ago season, a specific time in one’s life which invokes a powerful memory, or a generalized time period in one’s life) as well as songs about years. 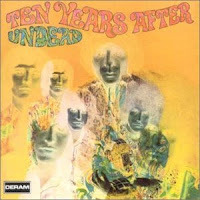 After all, one of my favorite British blues-rock bands is Ten Years After (the cover to 1968’s Undead is pictured) formed in November 1966 and named in honor of Elvis Presley (an idol of Alvin Lee’s), who popularized rock ‘n’ roll in the year 1956—a very good year indeed.